Harley Sweigart and Taylor Herson emerged victorious at the 2017 NM-TX Conference JBT Invitational, hosted by Silva Lanes in Albuquerque. Sixteen finalists in each division competed in the grueling triple-elimination matchplay finals. The scratch division finals hinged on round seven, where Harley Sweigart and Cortez Schenck, in a great battle for the all-conference points lead, played each other, with Sweigart dealing Schenck his second loss. Harley lost to William Yoder in the next round, while Stefan Wood eliminated Schenck, giving Yoder a bye while Sweigart eliminated Wood in what amounted to a semifinal, setting up a one game title match. In the finale, early opens plagued both bowlers but Sweigart stayed in control to defeat Yoder and earn the title, the 24th of his excellent JBT career, and another $1,000 payday. Avery Domaguin continued her stunning romp through the Tour the last few months by leading handicap qualifying here, finally going out in round seven in fifth place. 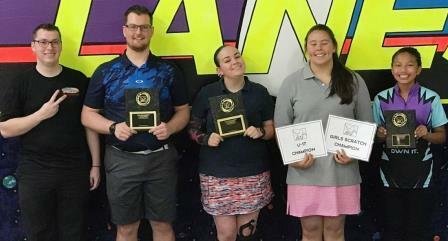 Down to four bowlers left, Gerilynn Delegarito ousted Montana Cdebaca, while Taylor Herson, still with only one loss, eliminated Deo Benard, setting up a title match where 'Sugar' would have to beat Herson twice to take the title. 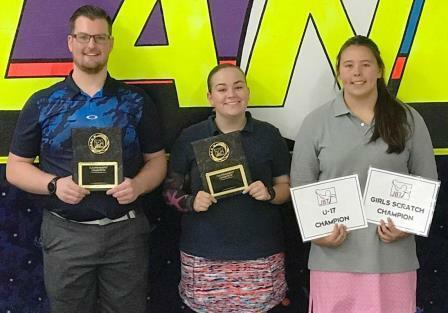 Taylor wanted none of that, firing 200 scratch in the first match to claim the victory, her second, and $1,000 top scholarship prize. Lauren Jaramillo was Queen of the Side Events on the day, winning the Girls Scratch Invite with a victory over Montana Cdebaca, and finishing the sweep with a U17 win over Daniel Hall for a $400 payday. Huge thanks to Silva for their usual great hosting job. The top 20 points scorers now advance to the 2017 Touring Players Championship, the most prestigious event on the JBT calendar!